There are a lot of things to love about Halloween: the haunted houses, the costumes, the candy! But perhaps my favorite aspect of Halloween is one I observe every year, even when I don’t elect to dress up or decorate much, and that is pumpkin carving. The origin of pumpkin carving is uncertain. In the United States, the first jack-o-lantern associated with Halloween was recorded in 1866, although carved pumpkins were first associated with the harvest season in general long before they became emblematic of Halloween. These days, the art of pumpkin carving has evolved into a complex affair, with numerous contests showcasing elaborate and inventive works of art that most of us couldn’t hope to equal. Yet there are resources available through DCPL that can help you create the jack-o-lantern of your dreams (or perhaps nightmares? ), such as How to Carve Freakishly Cool Pumpkins and Extreme Pumpkin Carving. Other good resources for techniques and ideas are available online. Did you carve an awesome jack-o’-lantern this year? Snap a picture and share a link to it in the comments! Here is one I’m particularly impressed by: R2D2 of Star Wars fame, carved just yesterday by my girlfriend. Below photos courtesy of Amy E.
I like to be scared. Not grossed out, and not shocked by violent images. A good scary movie—the kind I like—is hard to find, especially nowadays. The scariest movie I can remember seeing as an adult was when I saw The Blair Witch Project by myself (during a time in my life when I lived in a house in the woods—the movie and the screech owls in South Carolina had me running into my house after I got out of the car at night). The Conjuring, released this year, was not that scary, but then of course, I no longer live in the woods or by myself. Nor do we have screech owls bidding their hellos at night where I now live. The Conjuring tells the story of Lorraine and Ed Warren, paranormal investigators who founded the New England Society for Psychic Research in 1952 and who had dealt with the case made famous by Jay Anson’s 1977 book, The Amityville Horror (which was itself the basis for ten films released between 1979 and 2011). The Old Benton Library (formerly the Saline County Library) in Arkansas was investigated by a team of ghost hunters, and you can view their findings, including a video of them purportedly communicating with a ghost using the flashlight method; while the The Willard Library in Indiana allows prospective ghost hunters a chance to hunt for spirits themselves by viewing webcams located in the Children’s room, Research room, and Basement Hall. After hours the apparition of a young brown haired girl is seen. Books also tumble off the shelves. The library was built on the site of a hotel where a murder may have occurred. Scary stuff! Although generally speaking I’m skeptical of reports of paranormal phenomena, this blogger is happy to work in a library that isn’t haunted. With Thanksgiving a month away and Halloween just around the corner, pumpkin season is in full swing. This time of year, our taste buds are tantalized by a wide variety of pumpkin-flavored seasonal products, from tea to scones to milkshakes to Pop-Tarts, and my personal favorite, the delectable pumpkin pie (smothered in whipped cream!). And of course, the gourds themselves are in high demand for the traditional Halloween art form of jack-o-lantern carving. The library has plenty of books on the subject, including fiction and nonfiction titles. If you’re looking for some inspiration for your pumpkin carving, you might try Kids Pumpkin Projects: Planting and Harvest Fun or In A Pumpkin Shell: Over 20 Pumpkin Projects for Kids . Or you could peruse the numerous jack-o-lantern galleries available online; I found one featuring zombie designs! Halloween is upon us once again, and you can count on the Library to help you and your children get into the spirit. The shelves are abound with Halloween books that are informational, spooky and just plain fun, including my new favorite picture book, Ghosts in the House by Kazuno Kohara. The adorable story about a young witch girl and her haunted house is filled with retro illustrations that make this book not only a wonderful addition to the Halloween genre, but picture books in general. There are some great Halloween websites out there that are worth checking out. You can access a list of authoritative sites which include games, costume making, safety tips and more by visiting KidSpace @ The Internet Public Library. The Dunwoody Library, Doraville Library and Wesley Chapel-William C. Brown Library will be hosting Halloween programs this week. Stop by and check out these fun, free programs! How do you get in the Halloween spirit? I will be watching out for these frightening creatures on Friday as I tiptoe around the library stacks. 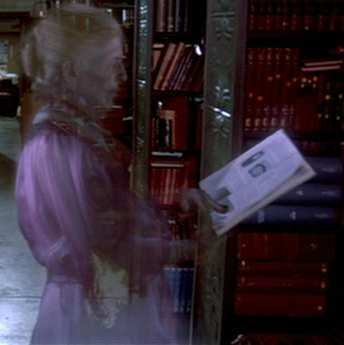 What do you most fear finding at the library? Ghosts? Ghouls? Goblins? Happy Halloween! Every year my best friends and I host a Halloween Party. This year, I’m hosting it at my new house. I really wanted to come up with some super scary and super creative snack and decoration ideas. So naturally, I used the best resource at my fingertips…the library! I browsed through this month’s periodicals for some ideas. “Everyday with Rachel Ray” gave me a great recipe for Pumpkin Ravioli (“Pumpkin Ravioli”) but “Good Housekeeping” proved to be the most helpful. First, it gave me a killer idea for decorating my entryway. Take fallen and dead slim branches and twigs from around the yard, and stand them up in pumpkins (use the pumpkins almost like a planter) then perch some ravens in the branches(“Halloween Magic”). CREEPY! But the best idea for cheap and easy decorating was on page 175. “Good Housekeeping” suggested photocopying somber 19th century portraits from history books and mounting them on black card stock. Place the portraits on a mantle or a shelf and add to the creepiness with candlelight and fake cobwebs (“Halloween Magic” p175). I decided that Civil War history books would be my best source for sufficiently severe and frightening portraits from the beyond. So I headed over to the 970s and pulled a bunch of Civil War books off the shelf, marked the portraits I found to be the most unsettling with scraps of paper and then photocopied them (for 15 cents a page) right there at the library. I took the copies home, cut them out and mounted them on some black poster board I had laying around. I put my own spin on the idea by hanging them up with black ribbon in a sort of horrifying collage on the wall in my hallway. I finished it off by putting an old candelabra, some tea lights and some cobwebs on my console table underneath. It looks GREAT! And the best part? It was virtually free!